Jovana Obradović was born in 1979 in Belgrade, where she graduated on the department of Music pedagogy of the Faculty of music in 2004. The same year, she finds employment as a professor of music in the elementary school ‘Ivo Andrić’. During the next 13 years, with her students, she wins over 80 awards on municipal, city, and country-level competitions in the categories of solo, chamber, and choir singing – on competitions ‘Zlatna sirena’, ‘Demus’, ‘Repulička smotra horova’. Her students mainly won 1st prizes and special awards. They had also shown notable results on the Republic festival of children’s musical creating ‘Fedemus – children composer’s, and thus from September 2007 she becomes a member of the elective jury of this festival at Belgrade Children’s cultural center. Since 2009, aside from composers and soloist, Jovana also works with and prepares the members of her school’s choir who sing back vocals in the studio, within the Fedemus festival, for music compilations published by PGP-RTS. From 2012 to 2017, she was engaged as an assistant conductor in the children’s choir ‘Horislavci’ in Belgrade, which, in 2008, became the children’s choir of the Opera of National theater in Belgrade. With her school choir, she has held many performances on television and radio shows, new year’s programs, national and international festivals, international congresses, important gatherings (jubilee of the Olympic committee and jubilee of ‘Boško Buha’ theater), and music videos by well-known Serbian punk and pop bands. From 2010, Jovana is an associate of the Publishing house Klett – as a reviewer of five music culture textbooks (from 4th to 8th grade elementary), as an author of methodical handbooks for teachers (music culture for higher grades), and as an author and creator of music textbook set presentations. 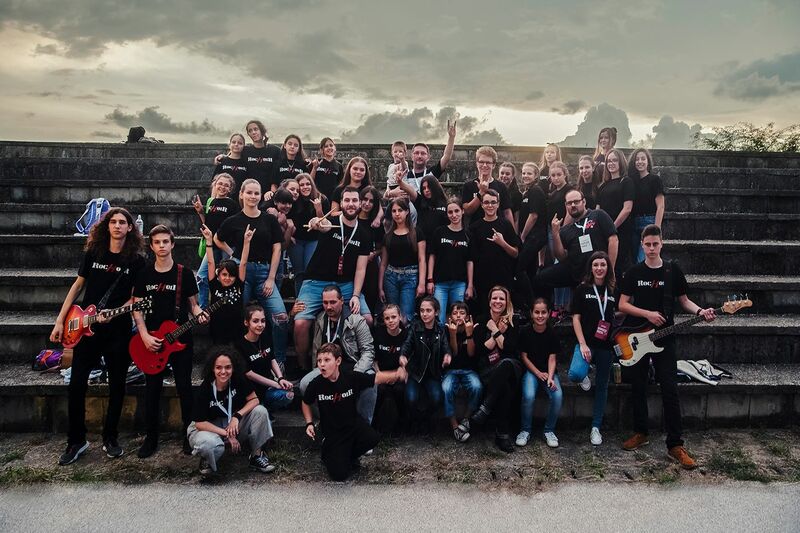 In 2017, she establishes the Rock choir, which achieves notable performances on big rock festivals within its very first year – BLOKSTOK festival in Novi Sad, and the international BORDER ROCK in Kladovo. The choir also collaborated with KOMUNA, a rock band from Sarajevo, in a track titled “Faraoni”. She is one of the co-creators of the Genius Rock project that has been officially approved and supported by the Ministry of Youth and Sports in 2018. The goals of the project are the promotion of rock culture, and use of modern technologies for the purpose of extracurricular education of elementary school students. Jovana’s motto is – If you can dream it, you can achieve it! Adrijana Nikić was born in Belgrade, 1993. She is a violin professor. Music has always been a big part of her life. At the age of 8, she entered music school, and through her education, she won multiple 1st and national prizes on violin and solfeggio competitions. When she was 10 years old, with Jovana’s support, who was her music teacher in elementary school, she began to sing and compose actively. The result were many 1st prizes on city and national competitions in categories for composing, solo performance, small vocal ensembles. She also represented Serbia on international festivals for children's music. In 2017 she got a master’s degree in violin on the Academy of Arts in Novi Sad, but states that singing is still her greatest love. Milica Mihajlović was born in 1998 in Kraljevo. She is a 2nd year student of music theory on the Faculty of Music in Belgrade. At the young age of 4, Milica was already aware that music is her calling. Before she started primary school, her family moved to Belgrade. Aside from formal musical education, since she was 8, she has been very focused on singing, playing, and composing. Jovana was her music teacher in primary school, and offered a lot of support. Since she began her education, Milica has won many city and national awards on solo and chamber singing competitions, as well as solfeggio, music theory, and musical forms competitions. With all these accomplishments, she was declared the best music gymnasium student of her generation in 2017. Currently, aside from studying music theory, she's also a student of solo singing. Jelena Joksimović was born in 2000 in Belgrade. She is currently a 4th year high school student. She made her first musical steps in the Children's Cultural Center at the age of 4, and to this day, she hasn't stopped perfecting her musical talent. Aside from completing primary music school - piano division, Jelena has educated her voice in contemporary singing and musical schools. Since the age of 8, she's performed at many music festivals dedicated to children's singing and composing, where she has accomplished notable results - awards for interpretation and compositions. At the same time, Jelena has garnered many awards in the fields of acting and natural sciences, as proven by her many national awards for best acting performances, as well as awards on mathematics and biology competitions. Although her interests are many, music has always been her greatest love, and a way for her to express her thoughts and feelings. Aleksa Ocokoljić was born in Belgrade in 2000, and is currently a student of the electrical engineering high school. At the young age of 6, he went to a Whitesnake concert with his father, and ever since then he has been infatuated with the sound of guitar. He entered an elementary music school the very next year, and later he continued to perfect his playing by frequenting schools that specialize in rock music. Since the age of 10, he’s constantly been performing as a solo accompanist or as part of the school’s orchestra, with Jovana’s assistance, who was his former music teacher in elementary school. Aside from many competitions, Aleksa has also played on a couple of international choir festivals in Belgrade, Rimini, Prague, Salzburg, and has been a part of television and studio recordings as a member of the school ensemble. He is widely known as “the guy with the guitar”. Janko Simović was born in 2002 in Belgrade, and is currently a student of the geodetic and music high schools. He received a guitar as a gift for his 5th birthday, and that was love at first sight. Aside from going to a music elementary school, with Jovana’s assistance, who was his music teacher at the time, Janko has been playing actively on many performances since he was 10 years old. As a vital part of the school’s orchestra, Janko has performed on many choir festivals both in Serbia and outside of it, as well as many television recordings. Upon graduating from music elementary school, he began to take an interest in playing bass guitar. Though a successful athlete, he sees his future in the unbreakable bond he has with music. Mateja Zeljković is the youngest member of our band – he was born in 2004 in Belgrade, and is currently a 1st year student of regular and music high schools; he studies guitar. He fell in love with the guitar when he was 5, upon hearing his father play Stairway to Heaven by Led Zeppelin. At the age of 8, he entered music elementary school, and won 1st prize on the national review the same year. In the following years, he continued to win many awards in this field, but at the same time he won 1st prizes on the city level in the fields of chemistry and mathematics. When he turned 10, he started singing in the school choir held by Jovana, a music teacher at that time, and the following year he joined the school orchestra as a guitarist. Musicality isn’t the only artistic talent that Mateja possesses – he expresses himself beautifully through fine, visual arts as well. Jana Milenković was born in Belgrade in 1998. She’s currently studying chemistry on a university in Hong Kong. Multitalented since a young age, Jana describes herself as a scientist at mind and an artist at heart. In accordance with this, during her education she has won multiple national prizes in the fields of solfeggio, theory of music, but also mathematics, physics, and chemistry. At the age of 8, she started her music education and began actively performing and creating music, with the assistance of Jovana, who was her music teacher in elementary school. She has won many 1st prizes in the categories of singing and composition, and has also represented Serbia on an international festival dedicated to children's music. One of her compositions from that period tells about the immense love towards music, and has been included in the 5th grade music education textbook as an example of children’s creativity. Since the age of 10, Jana has been performing with the school choir as a piano accompanist, because she enjoys music the most when she’s expressing herself through playing. Đorđe Đuković was born in Belgrade in 2002, and is currently a 2nd year student of the secondary school of mechanical engineering. Like many world-renowned musicians, Đorđe learned to play percussions by himself. His talent was seen by a teacher in lower grades when he was only 8 years old. From that moment, he became a member of the school orchestra and has played on all performances, both in school and outside of it – among others on international choir festivals, numerous manifestations, and television recordings, with Jovana's assistance. Though he is an up-and-coming football player who’s already achieved many acknowledgements, Đorđe’s love towards playing grows with every passing day, and he will soon start his musical education. Lazar Petrović was born in Trebinje in 1998. He’s currently studying sound design in Belgrade. He was 7 years old when he encountered a set of drums for the first time, and he decided on that instrument right in that very moment. His uncle taught him the basics of playing, and he began playing actively when he was 14. With his high school band, he performed at 'Gitarijada' in Zaječar. Lazar is currently the drummer of 'Hemmoterapia', but aside from playing, he's perfecting his knowledge about music production. In 2018, he joined the RocHoir band, and soon after the Genius Rock project. He described his acquainting with the rest of Rock choir as 'something extraordinary'.